Founded in 1962, Phi Omega has grown to become the largest Greek organization on campus, consistently having over 30 members. 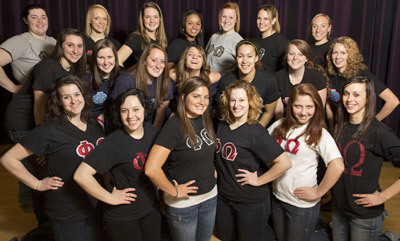 Each of the Phi-Os espouses the qualities of confidence, courtesy, humility, respect, and duty – the values of the group. Being very large, the group clocks an extraordinary number of service hours. Among their many service projects are highway cleanup, making holiday cards for the Hallmark Care Center, sponsoring children for Angel Tree, and donating money each month to a different non-profit organizations. The Phi-O motto, “True happiness consists not in the multitude of friends, but in their worth and choice,” perfectly fits the size of the group. Phi-Os share a strong sense of community, and through that community they reach their common goals.